Join leaders and innovators in teaching and learning at the 2019 Penn State Symposium for Teaching and Learning with Technology (TLT). The Symposium will take place on Saturday, March 16, 2019, at The Penn Stater Hotel and Conference Center. 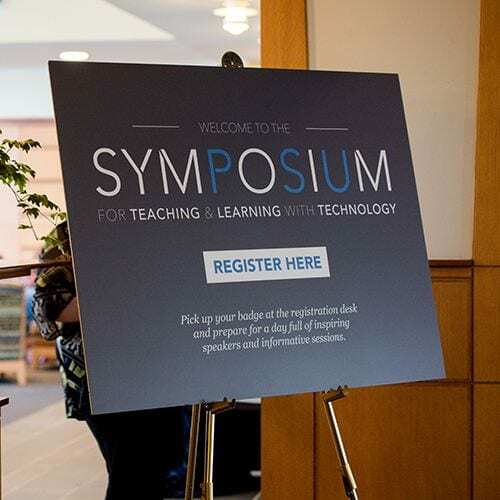 The Symposium, sponsored and produced by TLT, is an annual event showcasing keynote speakers, stimulating concurrent sessions featuring the work of Penn State’s learning innovators, and unique opportunities to build partnerships that transform learning. The Symposium is free for all Penn Staters interested in attending. In early October, we will announce our keynote speaker, open a request for session proposals, and make an open call for big ideas to compete in this year’s Open Innovation Challenge. The Open Innovation Challenge is a competition that gives faculty, staff, and students an opportunity to dream big. At the Symposium, five selected presenters will each have five minutes to present their pitch, and attendees will vote for their favorite idea. Have no fear, TLT staff is here to guide the five selected individuals with the process of preparing your five-minute presentation at the Symposium. The winning idea will be nurtured by a team of experts to develop it further. Visit http://symposium.tlt.psu.edu/ for updates and more information.